(7.2) Is the payment of pension in cash or through a joint account with or without “EITHER or SURVIVOR" facility permitted in the Scheme for Payment of Pension to Central Government Civil Pensioners by Public Sector Banks? (c) Payment of Arrears of Pension (Nomination) Rules 1983 would continue to be applicable to a joint account with Pensioner's spouse. This implies that if there is an 'accepted nomination‘ in accordance with Rules 5 and 6 of these Rules, arrears mentioned in the Rules shall be payable to the nominee. Existing pensioners desiring to get their pension credited to a joint account as indicated above are required to submit an application to the branch bank, from where they are presently drawing pension in the prescribed form that is i.e. Annexure XXIX of Scheme Booklet of Central Pension Accounting Office (CPAO). This would also be signed by the pensioner's spouse. (7.5.2) The pensioner/family pensioner may make request falling under both the categories above to either of the Branches. The paying branch will fonNard the request along with the disburser’s part of PPO, where applicable, to its CPPC for necessary action. 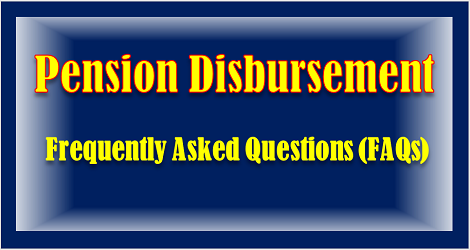 Before fon/varding the disburser’s portion of PPO to the new paying branch/CPPC, it will be ensured that the month upto which the payment has been made is invariably indicated in the disburser’s portion of PPO. The receiving CPPC on receipt of the pension documents will ensure fonNarding the PFC to the paying branch if it is for the same AB or to the concerned CPPC if for a different AB within three days and intimate the facts to the pensioner simultaneously. Necessary intimation of effecting such transfer will be sent to CPAO by the new as well as old CPPCs in the form as at Annexure XXI (page-49 Scheme Booklet) as well as the escroll for keeping a note of change in their records. “Certified that payment of pension has been made up to the month ___________ and that this PPO consists of _________ continuation sheets for recording disbursement." (7.6.3) Transfer applications in duplicate shall be fon/varded immediately by the Pension Disbursing Authority along with the disburser's copy of the PPO halves, duly authenticated and written up-to-date to the CPAO for transmission to CPPC of the AB for arranging payment after keeping necessary note in their records. Action will also be taken by Pension Disbursing Authority to update the entries of payment made in the pensioner’s portion of the PPOs, if not already done, before the transfer application is sent to the CPAO. (7.6.4) If a PPO (disburser's portion) has got torn or mutilated, it will be renewed by the CPAO with the help of PAO, if necessary, before sending it to the CPPC.